The Art Beat Presents: In the Artist’s Corner. Every week, I will interview interesting and talented folks who are passionate about their craft and trying to make a difference via whatever vehicle they choose. 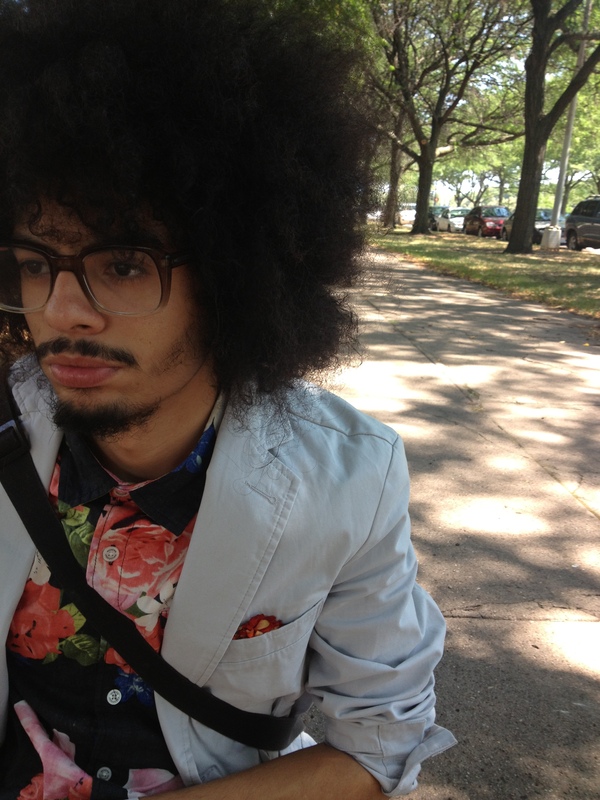 This week I’m interviewing poet, Giovanni Michael Garced. I discovered the young writer in the poet circles on Tumblr last year and fall in love with his writing, as well as his halo of hair. As an aspiring poet myself, I’m always in awe by people my age who have the wisdom of writers in their prime. 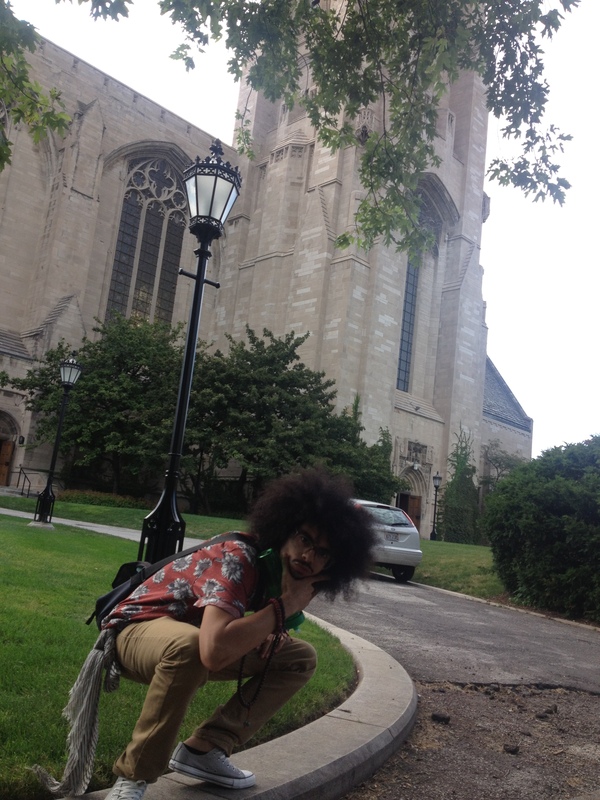 Already selling his second chapbook, Sunflower Calligraphy, Garced is already on his way to become someone we will be talking about for years to come. My name is Giovanni Michael Garced. I am a 20 year old writer/performer/idea-haver from Miami. I am a natural hair and mango enthusiast. I am nomadic and like laughing a lot. When did you get into writing poetry? When did you get into performing? I started writing poetry in middle schools trying to get girls to like me. Got more serious once I got hit in the face with a lot of sadness and reality. I began performing my Junior year of High School. I think I gave too much. But there are many many many more I have to read and some I couldn’t think of on the spot. The light in me? There is God in me trying to be heard. There is a quote from Sylvia Plath : ” I write because there is a voice in me that can not be stilled”. So like I create because there is a light in me that can not be stilled…or dimmed or put out. You get what I am saying. Creating gives me purpose and that’s what I want to do with my life. Create. Also giving sound to the silences within myself and those around the globe. Talk about your newest chapbook, how long did it take to create and how do you feel about it? Well I’ve been trying to make this ever since I put out my first one. I knew once I dropped the first one I wanted to make a second one. So from idea to materialization it took about 9 months. It was very slow because of a lot of things I was going through. Barely writing for 7 months. Not performing for like 7 months. Personal mess that held me hostage. Things like that. I pushed through a lot of walls. Like every writer in regards to their own work, I hate it. [laughs] Well not really, I’m just very critical of my work and overly humble to the point where I’m rarely satisfied with what I put out. But the bright side to that is it keeps me hungry. I do feel good about the rawness of it. A couple of the poems are drafts. Bare in mind no poem is ever finished but those couple of poems aren’t as close to completion as the others. And I just think it’s cool that I can share seeds with people. So hopefully the next time they see it they will see a forest. I am happy that I put it out and left a piece of me on this earth that will live forever. 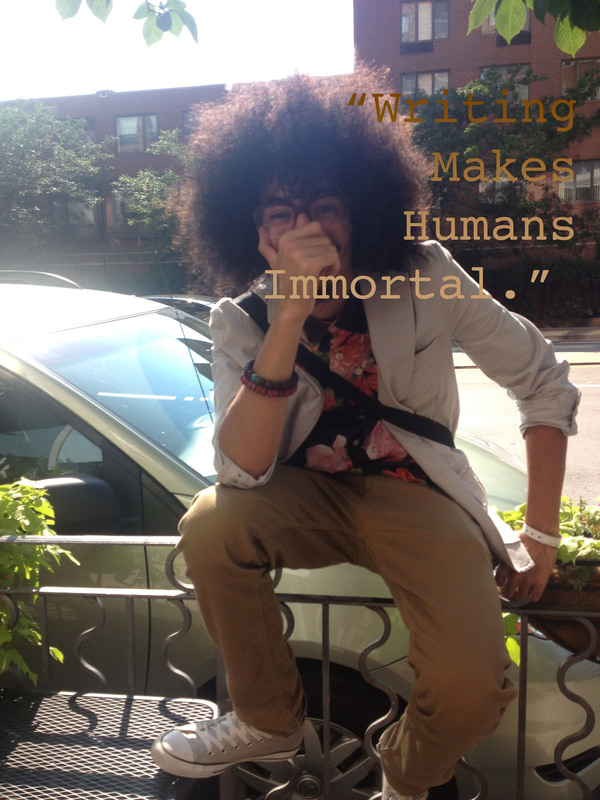 Writing makes humans immortal. What are you currently in love with, in regards to these topics: music, films, books (can include comic books/etc), tv shows, or anything related to art)? Besides writing and performing, are there any other creative or non-creative outlets that take part in? I paint sometimes. I’m half okay. I like doing hands on visual art. I used to draw a lot when I was younger. I make beats or I try. It’s fun. and stressful. What’s one of your favorite pieces you’ve ever written? Alzheimer’s with Samantha Turner. That piece let me know that I can die and know I served the purpose of art. To genuinely move someone, move a stranger. My words are in those people’s blood. And that energy will always exist. I realized that when a stranger ran up to us and just sobbed in our arms and wasn’t able to speak through her tears. I know you was a mentor for young and aspiring writers/performers, tell me a little bit more about your experiences with that? Ah, that was crazy. It was testing because I never thought mentoring is something I could do. It was especially testing because I was working alongside my own mentor. I’m going to throw one of my comparisons/metaphors that probably don’t make any sense to any one but me. He is like the ocean and the kids are fish. and I was rain. How does rain find a way to nourish/stimulate/affect the fish you get me? so that was an adventure in it’s own to find a balance. I learned a lot about myself. I learned that there is not one kind of mentor. I learned that I’m not the mentor I was trying to be and learned that that is okay. That wasn’t something I could give. Something I learned to accept. I found my role and found the seeds in them as individuals and as a group that I needed and was able to water you know. It was a real nice feeling seeing them on stage knowing I was a part of that journey for them. If you have to give one piece of advice to anyone trying to become a writer/performer what would it be? That’s just what helped me and opened my mind. Reading and watching all these different people. You can’t be that one dude in the cave drawing maps of the world. Something that big will have many interpretations and those views will help your sight grow. When I opened myself to others I learned so many things and my writing grew so so so much. Light feeds off light. Anything else you would like to add for folks to know? Yo it’s ya boy, you already know what it is. Giovanni Michael Garced in the building. Sunflower Calligraphy is my second chapbook. It came through the fire. It’s a big part of me that I want to share with as many people as possible. I want my art to travel everywhere I haven’t been and can’t travel to yet. It’s Important for writing and all the voices we have inside to travel. I want to spread everywhere. Creating this helps me do this. Check the links, purchase a book or watch me do things behind a microphone. Thanks so much to Gio for being my first interview for In the Artist’s Corner. I hope to continue on with this segment with others like him in the future.